I have been asked by many turners to produce a Tool like the Mate #1 and #2 but one which has the stability and capability to hollow deeper vessels. The NEW MEGA MATE #2 is the same basic design but a much larger tool than the Mate #1 or #2 with a lot more integrity ! 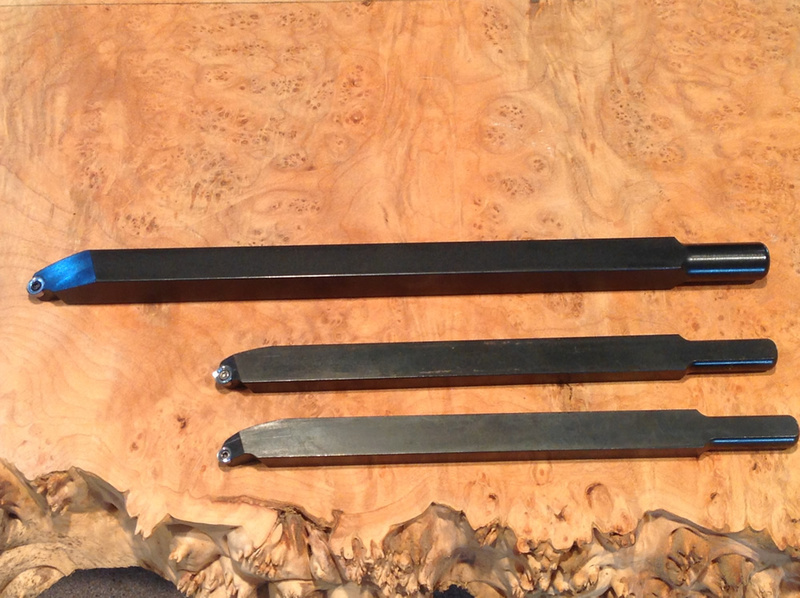 The bar is 5/8 square section , with a turned round 5/8 tang. ( Look at the Diagram and info below )Beautifully machined with a chemical black glossy finish to the bar. The tool will fit directly into a 5/8 Quick release unit or into any of the many available handles with set screws with a 5/8 hole.It features an 8mm cutter allowing rapid removal of wood with great control. The bar including tang is 11 ½ inches long allowing the turner to hollow deeper. As with the Mate# 1 and #2 the cutter this tool can be used to hollow end grain , long grain , wet or dry wood and will resist “self- feeding “ unlike traditional scrapers. Ideal for hollowing deeper Bowls! overhang, L. That, of course, is why one tries to minimize the overhand. Doubling the overhand increases the deflection by 8 times! Another point is that the width, w, effects the deflection only directly, and not as some power of w. So, making a tool, say a scraper, twice as wide only serves to reduce the deflection by a factor of 2. BUT the depth, D, of the beam is in the equation as the cube. So, if D is doubled, the deflection is reduced by a factor of 8 (2 cubed = 8)! This is the situation with my new “Mega Mate Tool “. 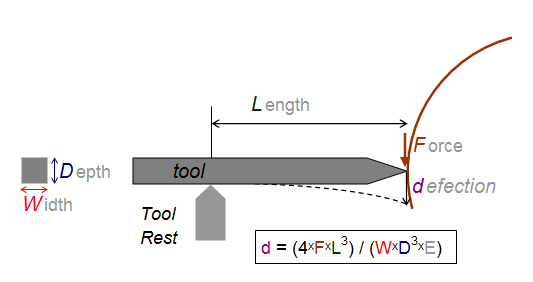 This relationship between width, depth and deflection demonstrates why making a scraper thicker is much more effective for reducing deflection than making it wider. E in the equation is a property of the material called Young’s Modulus. In this case, all the tools are steel so E is constant. But, if you were, say, to make the tool out of aluminum (or aluminium), which has a value of E that is only one third that of steel, then the deflection would triple for the same tool shape! And, aluminium ‘might’ not hold an edge too well!